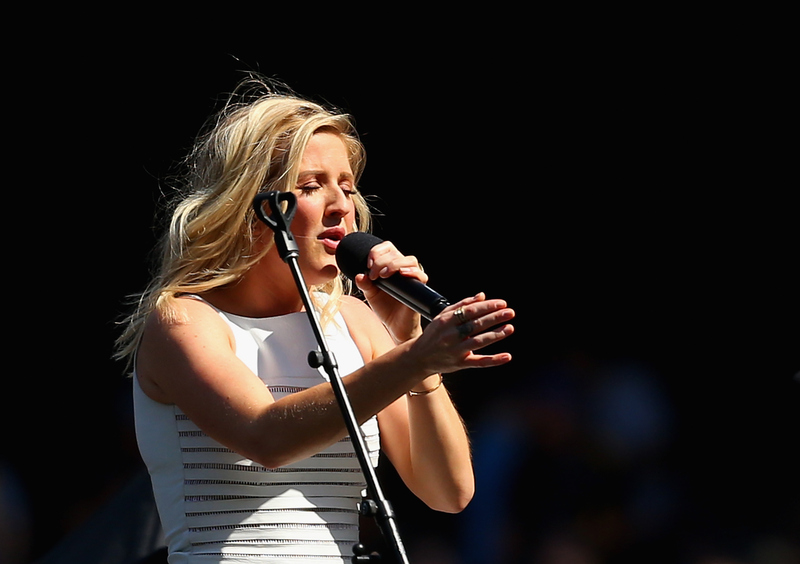 A certain British songstress is definitely having her time in the sun — after all, hot off of her performance at the Victoria's Secret Fashion Show, Ellie Goulding just snagged her first Golden Globe nomination. She's nominated in the "Best Original Song" category for her omnipresent hit, "Love Me Like You Do," which was penned for Fifty Shades of Grey. Since this will be her first time attending the awards show as a nominee, I think we can all assume that she's going to come armed with her best fashion game — which begs the million-dollar question, what will Ms. Goulding wear to the Golden Globes? Judging from past red carpet numbers, I think we can infer that Goulding really favors cut-outs (cases in point: the recent Victoria's Secret Fashion Show, the London premiere of The Hunger Games: Catching Fire, and the 2011 AMAs). She also tends to wear a lot of black, and she's no stranger to the dramatic plunging neckline, or the equally-dramatic leg slit (for an example of all three trends worn at the same time, see: the 2015 MTV EMAs) — so, with all that in mind, here are a few dresses she might just rock on her big night. This daring, lacy number lines up nicely with Goulding's red carpet M.O. This cut-out number could actually make quite the elegant statement. This simple-yet-striking gown would also cut a nice figure — picture it; it's the perfect Golden Globe-accepting dress. Goulding likes to bring the red carpet drama, and this is about as dramatic as they come. Liquid-y sequins. Need I say more? And last but not least? This gorgeous ombre gown is so perfect for the "Love Me Like You Do" nominee that I might actually get a little angry if she doesn't wear it.